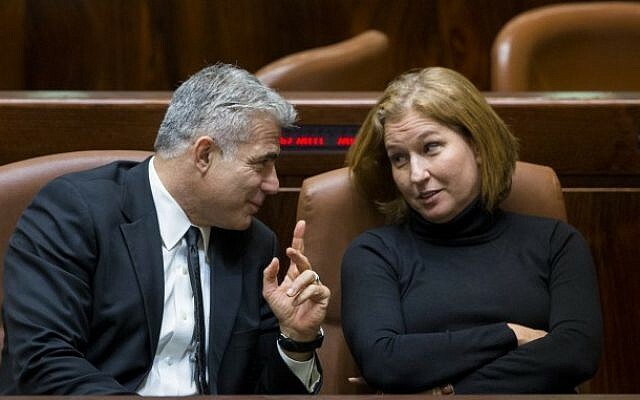 Yesh Atid leader Yair Lapid and Hatnua’s Tzipi Livni will not be forming a center-left bloc in a bid to challenge Prime Minister Benjamin Netanyahu and his ruling Likud party in the upcoming elections, Hadashot TV news reported Monday. For her part, Livni is said to have likened Lapid to the prime minister. The two party leaders have met to discuss a possible political merger a number of times since Labor chair Avi Gabbay split with Livni when he dissolved the Zionist Union during a live TV broadcast on January 1, the Haaretz daily said Sunday. 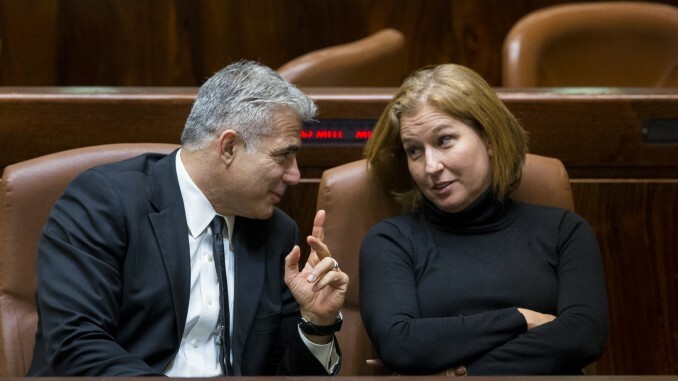 According to Haaretz, Livni agreed to cede the number one spot on a joint Hatnua-Yesh Atid list to Lapid. 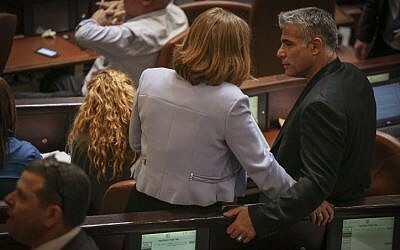 Lapid was reportedly seeking to unite with Livni after failing to bring in voters from the center-right over the past three years. The Yesh Atid chairman was said to hope that if a Lapid-Livni list was popular enough with voters, he would also be able to court former IDF chief of staff Benny Gantz. However a Monday report said Lapid-Gantz talks are stymied by the fact that neither wants to relinquish the top spot in any such partnership. Livni told Lapid that she could bring five or six seats to any political party or faction, according to Haaretz, and that the addition of Hatnua to a center-left bloc that includes Gantz would have a large enough voter baser to challenge Likud in the April elections. Lapid has also reportedly discussed a political merger with ex-defense minister Moshe Ya’alon and his Telem party. Last week, Channel 10 news reported that Ya’alon and Lapid discussed the possibility of a political alliance or “partnership” at length during a meeting on January 3. 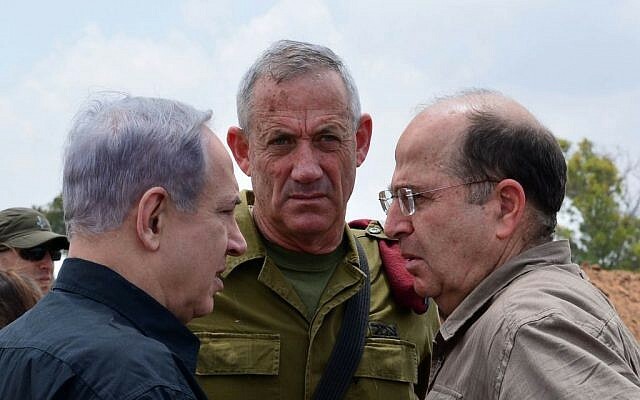 Ya’alon launched his Telem party in early January to run against Netanyahu, whom he had frequently criticized since his ouster from the Defense Ministry in 2016. But recent polls have indicated Ya’alon would fail to clear the minimum vote threshold needed to enter the Knesset. Reports have said he is also in talks with Gantz to form an electoral alliance, with the latter doing well in the polls. Gantz, who commanded the military when Ya’alon was defense minister, formally entered politics at the end of December with the registration of his new party, Israel Resilience. Surveys have said Gantz’s party would finish second to Likud in elections, though well behind it. They have also indicated he could pose a more potent challenge to Netanyahu’s ruling party if he were to team up with another centrist party. Reports of possible political unification moves between center-left parties came as Labor, Israel’s traditional center-left party, has been losing voters after Gabbay split with Livni. Gabbay broke up the Zionist Union, humiliating Livni by announcing the move on live television in her presence without having informed her in advance. Rather than boost Labor in opinion polls, the split reduced the party’s expected showing to only seven or eight seats. In the outgoing 120-member Knesset, the Zionist Union holds 24 seats. On Thursday, Gabbay was met with boos and whistles at a Labor conference as he sought to persuade his bitter and divided party that he can defeat Netanyahu. 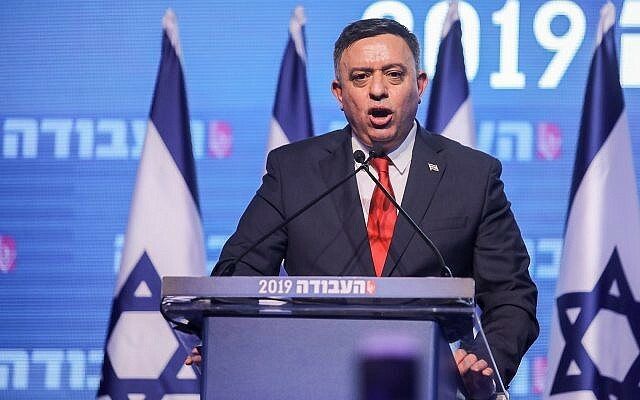 Facing calls for him to step aside as the once-mighty political force wallows in dismal poll predictions, Gabbay attempted to ignore the pandemonium and present himself as a credible alternative to the prime minister, whose Likud party appears on course to reelection. Both Gantz and Lapid are understood to oppose any alliance with Gabbay and the center-left Labor, since they are trying to capture votes from left and right; he has said he would insist on heading any such partnership.